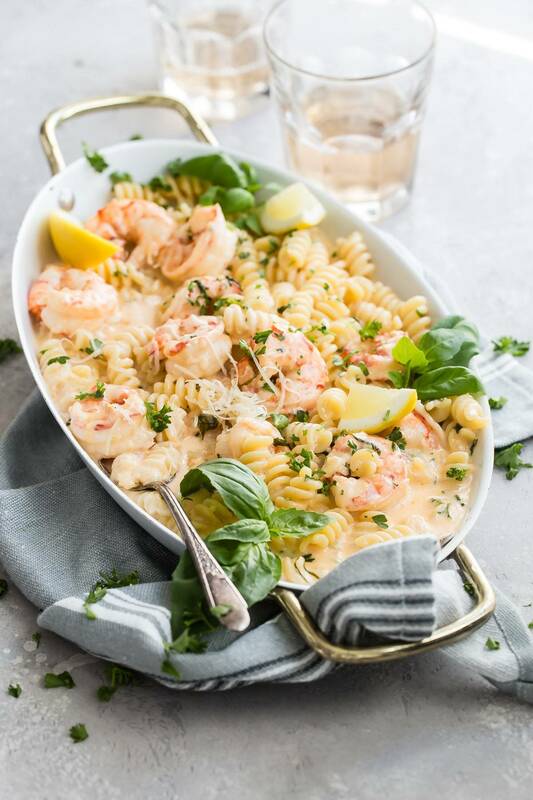 This lemon garlic shrimp recipe is so rich and creamy you’ll need some bread to mop up the leftover sauce! It’s that good. The ingredients form a short list for this lemon garlic shrimp recipe and it’s easy to make! That’s really all we need to know right? No way, we need to know how good it tastes, will I have seconds (or thirds) and if the whole family is going to like it. Basically the answer to all of those questions is just a simple… yes. It tastes rich. If you’re watching calories then this healthy quinoa salad might be a better choice, I prefer to be honest and this is loaded up with dairy. 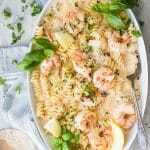 As spring takes its turn to be next to visit us, that means lots of lemon recipes for me, and lemon and shrimp are a great combination. Make sure to use large shrimp for this recipe. We don’t want to be moving our forks around looking for any mini shrimp! I love shrimp and I want to know that I’m eating them, the bigger the better! Don’t skimp on the garlic either because it seems like a I added a lot but the cream and butter really mellow it out. This is like an Alfredo sauce gone wild and would also be perfect with chicken if shrimp are not your favorite protein. Lemon juice and fresh basil (lots) are two final components to an easy and family loving dish that you’ll probably make again and again! Check out these other easy lemon recipes that I think you’ll love! 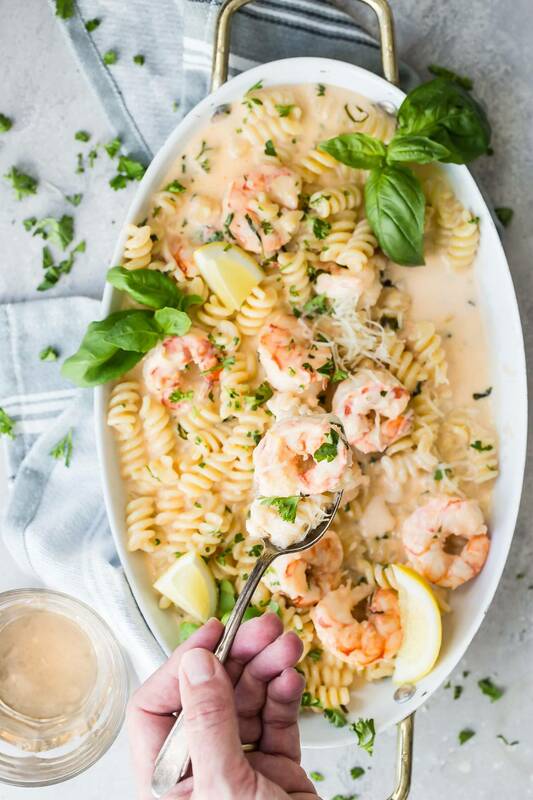 Amazing and delicious lemon garlic shrimp! 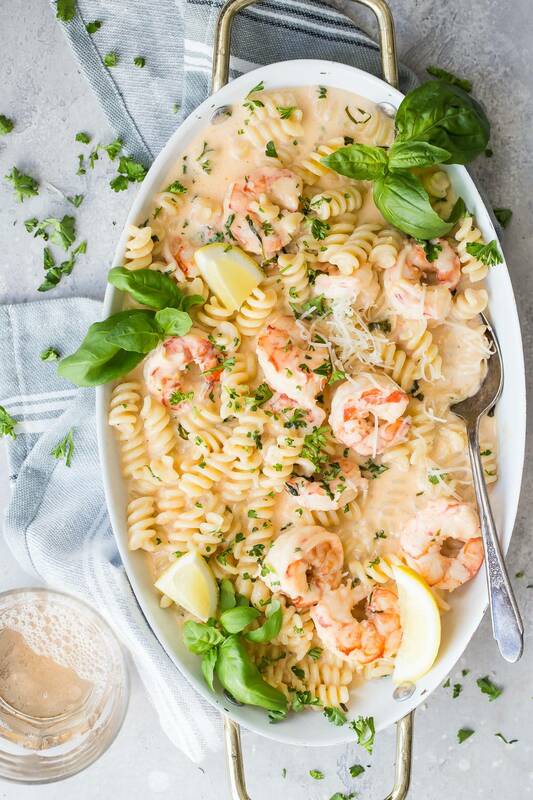 These giant shrimp are cooked with pasta in a rich and creamy lemon garlic sauce! Fill a small pot with water and bring it to a boil. Add the pasta and cook until al dente. Drain the pasta in a colander and set aside. In a medium sized saucepan, melt the butter. Turn the heat down and simmer for 5-7 minutes and the sauce has reduced a little. Add 1 cup plus 1/3 cup of the grated Parmesan to the pan along with the lemon juice and garlic. Whisk the cheese into the sauce until it has fully melted and season with salt and black pepper. Add the shrimp and simmer for another 5-7 minutes turning the shrimp once. Serve with fresh basil and the remaining Parmesan cheese. Did you forget the garlic in the instructions?